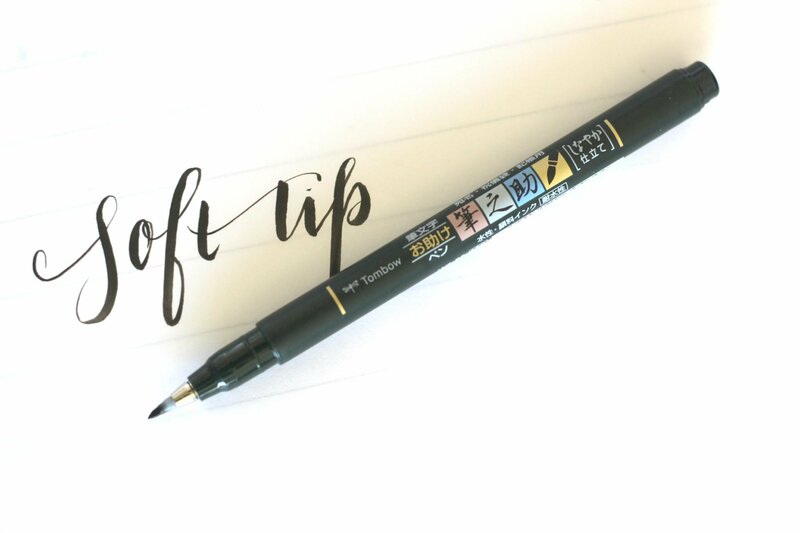 This Tombow Fudenosuke Brush Pens Review discusses the hard and soft tips of this versatile brush pen that is great for beginning and advanced letterers alike. I have been meaning to do a Tombow Fudenosuke Brush Pens review for quite a while. I am often asked what my favorite brush pen is, and although that changes from time to time, I find myself reaching for these pens pretty frequently. 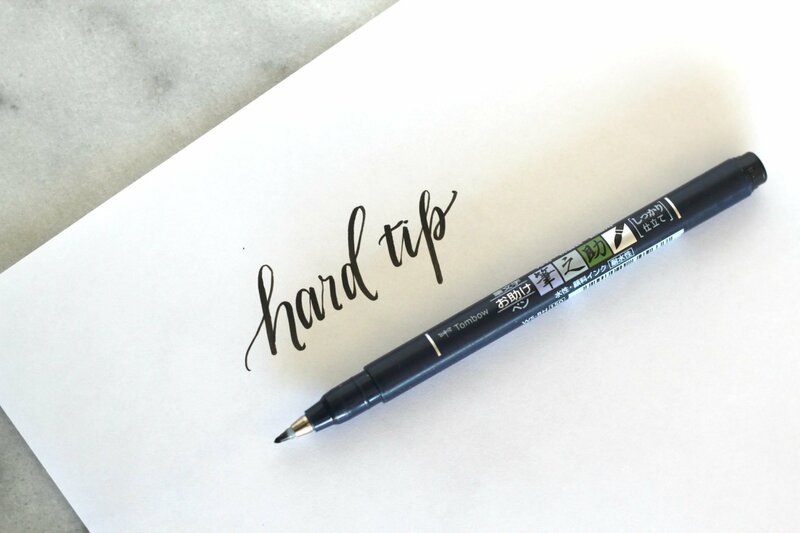 Check out the brush lettering resources page and get free lettering lines printables for your brush lettering! 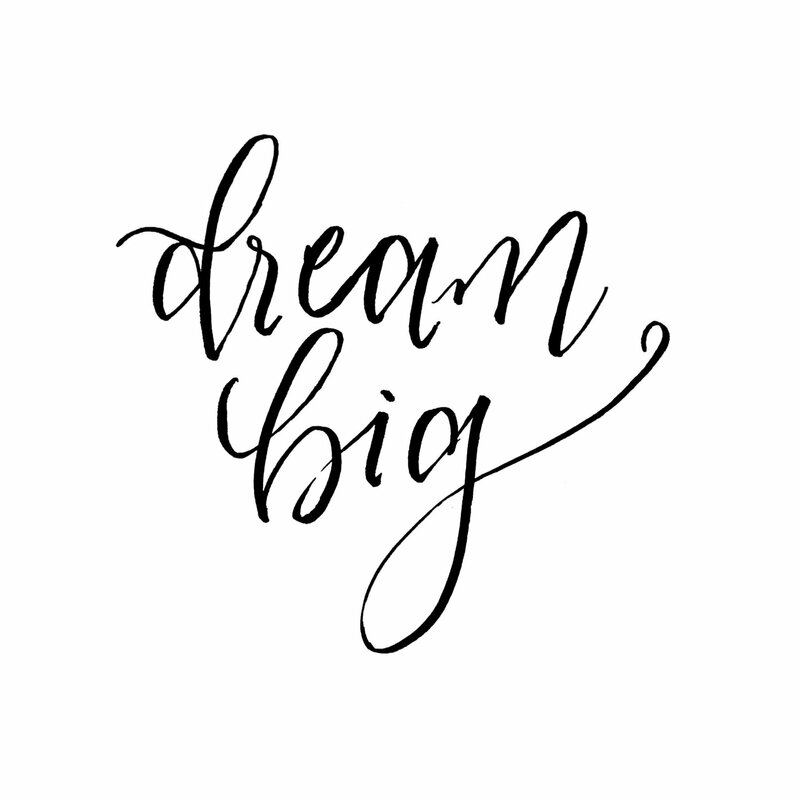 Follow my instagram page that is just for lettering and calligraphy here! I have been lettering for a while, but I am only now getting up the confidence to show my work. One of the things that I love is to experiment with is different types of pens. Every pen has it’s own feel and flow to it and each person is going to have their preferences. I am going to start reviewing lettering pens and giving my honest thoughts and opinions on them, starting with the pens I use the most, the Tombow Fudenosuke pens. The Tombow Fudenosuke pens are quite possibly my favorite brush pens to use and are a great choice for those new to lettering. I carry one of each in my purse at all times, and I practically buy them in bulk. 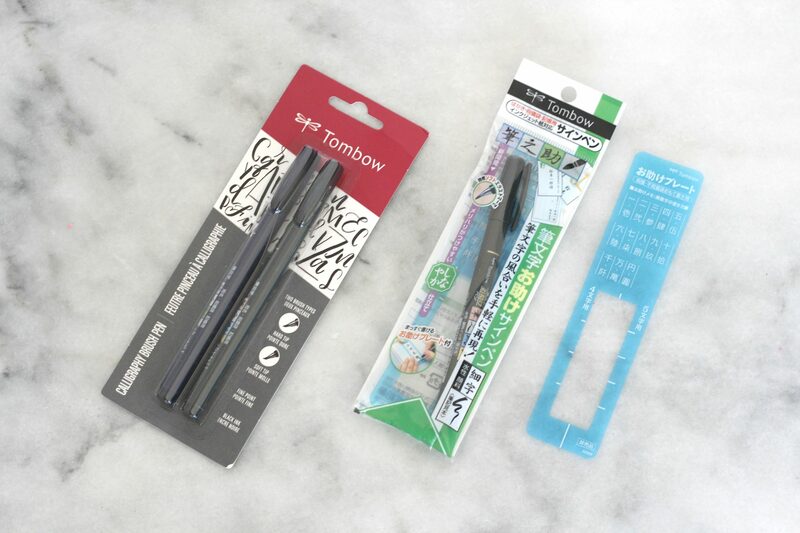 The Tombow Fudenosuke pens can be purchased either individually or as a set. Overall, the quality is high and they are quite affordable, averaging at around $3 – 4 per pen. Ink: The Tombow Fudenosuke hard and soft tip pens come in black. The black is not streaky or too inky, just a lovely, solid black. The black makes the artwork easy to scan and digitize. The ink is water-based and it odorless. There is a Fudenosuke Firm Twin Tip that comes with one tip in black and one tip in grey, I have not tried that yet. Updated: The Tombow Fudenosuke pens (hard tip) now come in color! Click here! Tips: The tips of both the hard and the soft Fudenosuke pens are elastomer, so they are a type of flexible plastic. The hard tip gives a narrower downstroke and the soft tip gives a thicker one. I have found that if used improperly, the elastomer will lose it’s firmness, and not give those fine and extra-fine strokes as well, but not as easily as say the Tombow Dual Brush Pen, which has tips made of nylon. Longevity: I have found that the tips for both the hard and soft pens last a bit longer than other brush pens. They will last longer if they are used on high quality paper that isn’t too fibrous. I used to use copy paper for practicing, and it really destroyed the pens. I now use a higher quality laser printer paper or special marker paper. I can typically get about a two weeks of daily use out of each pen before either the ink starts drying out or the felt tip gets damaged. It is my experience is that the ink is used up before the tip gets frayed, and it’s unfortunate that the pen is not refillable. Although this does not seem like a long time to the lay person, this is quite a bit of use and seems quite long for a disposable pen. Packaging: I have seen two different types of packaging for the Tombow Fudenosuke Brush Pens. The pens I have seen at craft stores, such as Michael’s and Hobby Lobby are packaged with one of each of the pens on a card. The pens that I have ordered off of Amazon, appear to come from Japan. They are packaged individually, in plastic. Each pen comes with this fun little plastic ruler. 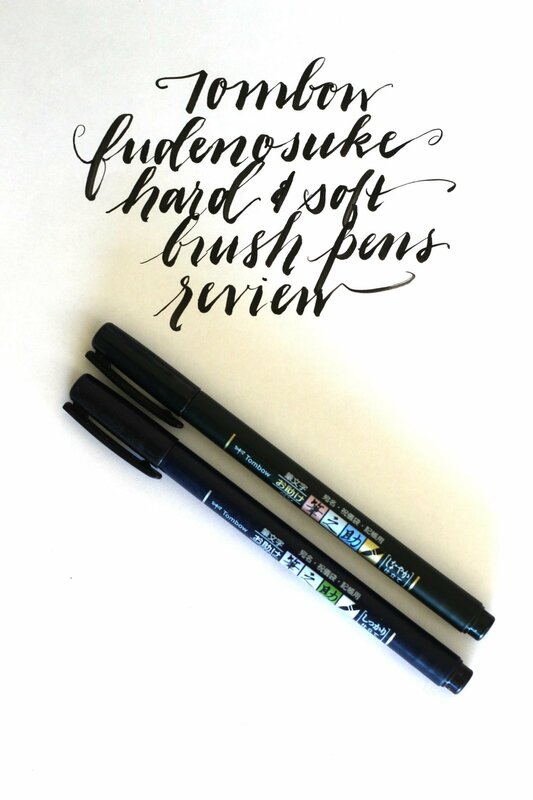 What do you think of this Tombow Fudenosuke Brush Pens review? Do you have any other questions that I didn’t answer? If so, then please leave a comment and I will do my best to answer them! Thanks for giving the lifespan of your pens. I’ve just started lettering (with the Fude Hard Tip) and I get about a month of daily practice from them. I had heard they didn’t last long, but wasn’t sure what “long” might be. I also suspect I’m not really holding the pen right and may be smushing the tip – I’m working on that.